The all-new i3 goggles are offered in 2 models—monocular and binocular. 800x600 color Oled display(s) with specifically designed eye cups for indoor and outdoor viewing—mounts on hat, glasses or headstrap. 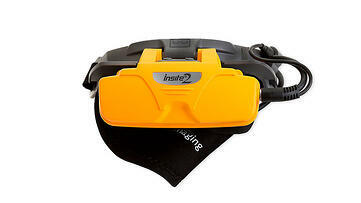 i3 goggles are small and lightweight, compatible with Ibex EVO®, Pro, and Lite, as well as with Bantam and Easi Scan 1-4. Projects ultrasound images into a goggle-style headset. Ideal for working in bright sun and reflective conditions such as water. Most commonly used in bovine reproduction, aquatics, wildlife. 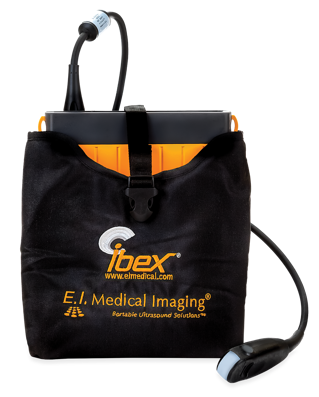 Accommodates both the Ibex® PRO and PRO/r (in closed position), LITE and SuperLite. Keeps unit self-contained and streamlined when scanning with headset. EVO® remote bluetooth connection—auto-connects once paired with an EVO® I or II. 7 keys can be reassigned to any key on the EVO for versatility...use to control gain, depth, save and record images, or other custom features.